We are contributing in different ways for the development of nearby towns and villages. As part of corporate social Responsibility (CSR), we have taken in the efforts to widen the roads in the area. Computer donation to schools, building a bridge for the convenience of the public, house construction for the poor are some of the CSR activities done at Pithrody Village. 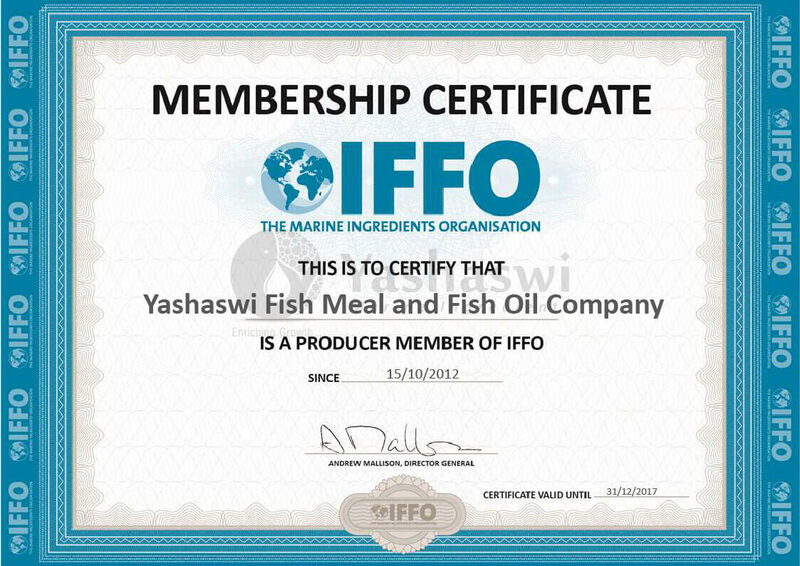 Yashaswi Fish Meal and Oil Company is a flagship company of Yashaswi Marine Products, located in Udupi, a coastal district in Southern India. Together with our customers to provide safe raw materials as a basis for sustainable food production. 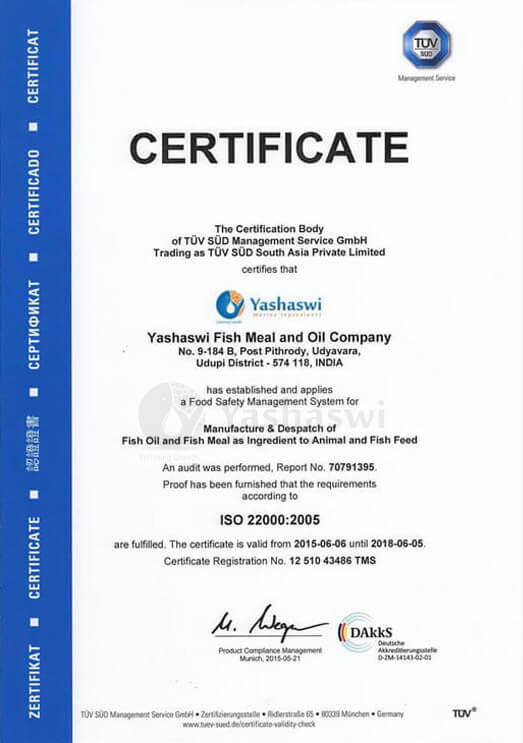 Yashaswi takes pride in its strengths which primarily lies in supplying our customers with the highest quality product combined with highest quality service. Yashaswi has created a work culture where employees happily achieve highest delivery standards. 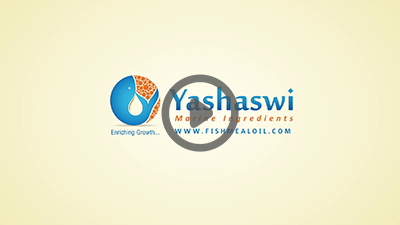 Yashaswi fishmeal and oil company established in 2007 is a leading company in its segment in the country bringing to the world the bounty of the Arabian sea. 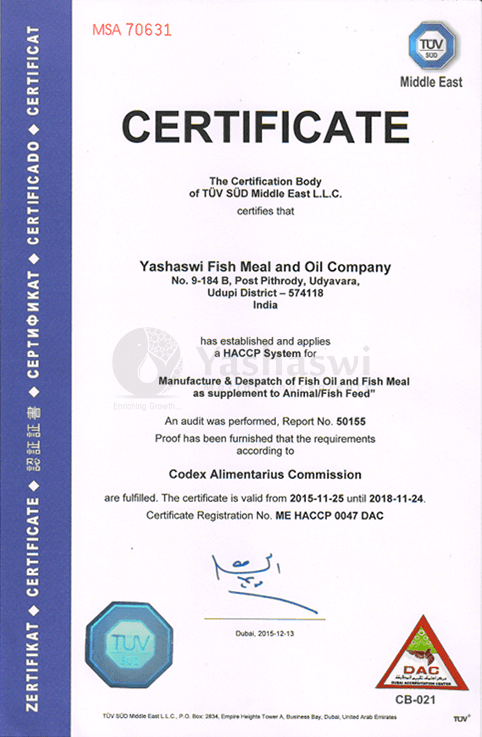 Yashaswi takes pride in its dedication to the highest quality standards that is possible in the market to satisfy its customers to the fullest. Continuously striving to innovate in methodology, quality processes and customer service is the cornerstone of its success. 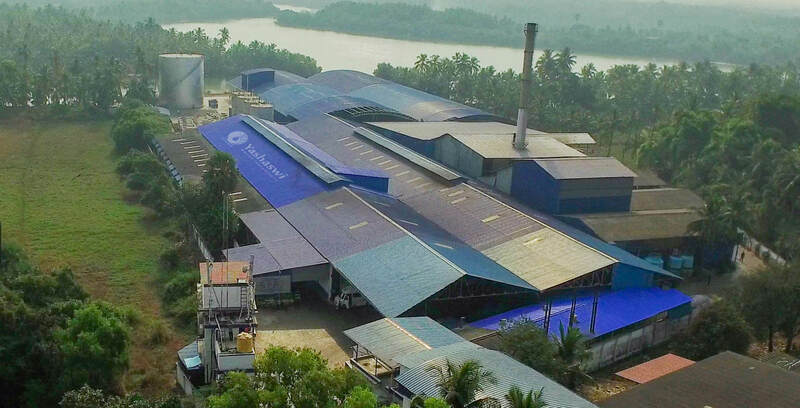 Yashaswi is equipped with the most modern facilities which is fully automated state of the art plant which gives it the competitive edge in ensuring highest quality standards. Source quality materials from approved suppliers. 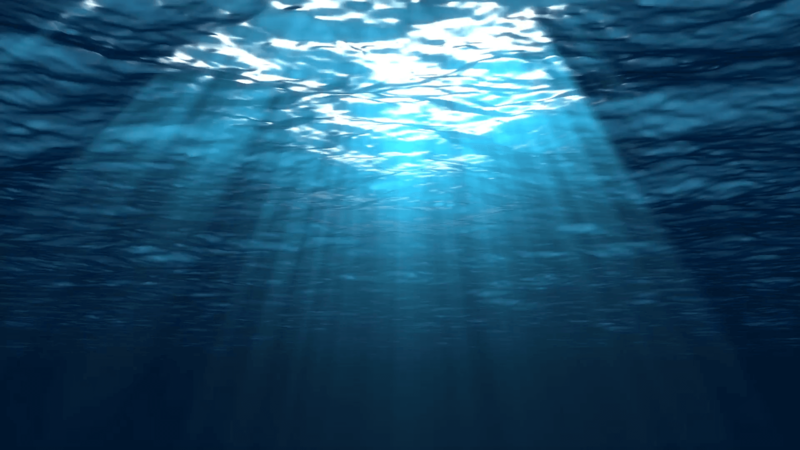 Focus on the main aqua feed producing markets.  Utilize our market knowledge and organization in key markets to penetrate new market segments. Yashaswi takes pride in its strengths which primarily lies in supplying our customers with the highest quality product combined with highest quality service. All this is done while we take care of responsive sourcing , following safety standards and contributing with CSR activities. Yashaswi has created a work culture where employees happily achieve highest delivery standards. This is made possible by creating an environment by motivation, safety standards, employee care and benefits. The procurement is based on following criteria: Count, temperature, smell, appearance, texture, gill color and all other organoleptic parameters. The raw materials which we procured are transported in insulated vehicles with good hygienic condition. 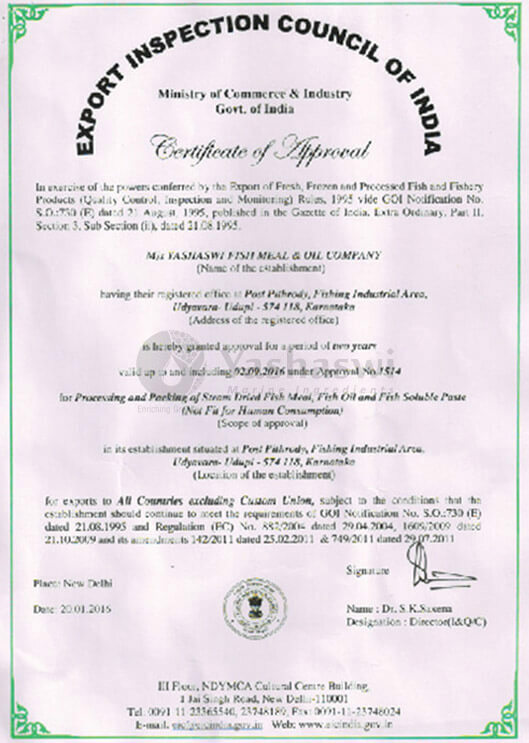 Our catch is done on Arabian sea which is food and agricultural zone 051 and Bay of Bengal which is 057.
we are situated on the west coast of India, which is popular for vast resources of pelagic fish like sardinella longiceps (sardines). Geographically we are situated on the west coast of India, which is popular for vast resources of pelagic fish like sardinella longiceps (sardines). We are just 5kms away from main fishing port (Malpe) and hence enables us to process fresh catch. The Indian oil sardine (sardinella longiceps) is a species of ray-finned fish in the genus sardinella. It is one of the two most important commercial fishes in India (with the mackerel). the Indian oil sardine is one of the more regionally limited species of sardinella and can be found in the northern regions of the Indian ocean. Being rich in EPA+ DHA content, the fish oil plays a major role in growth of farmed produce, salmon fish farming and also it’s an essential ingredient for pet animal feed. This port of Malpe is located at the estuary of Udyavar river in Udupi District and is a natural port about six kilometers to the west of Udupi, Karnataka, India. An important port and fishing harbour on the Karnataka coast. It is a suburb in Udupi city. Location : latitude 13˚ 21′ N and longitude 74˚ 42.5′ e.
The Raw Material once received in the factory are subjected to inspect as per our criteria. 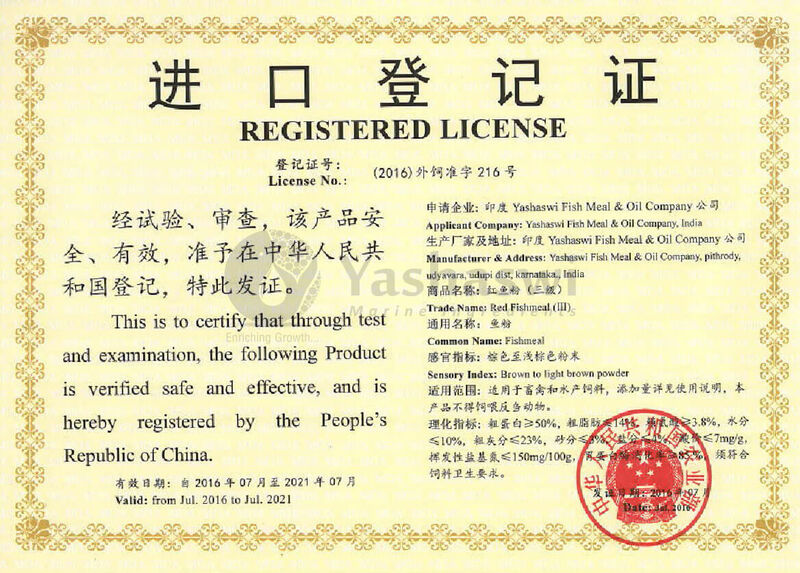 The procured raw material which meets the acceptance criteria are subjected to the production of Fish Meal and Fish Oil. The Fish Meal and Fish Oil which we produce are dosed with Food Graded Antioxidants. 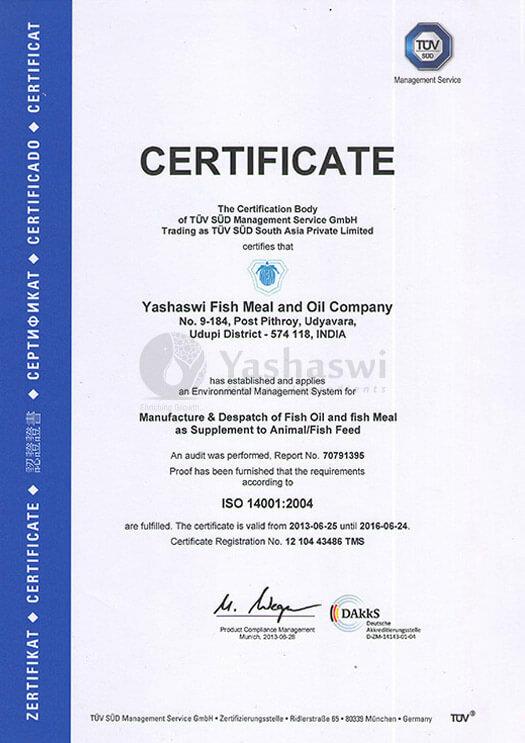 The fish meal and fish oil which we processed are analysed at different stages during the process. The complete warehouse is managed by the latest in warehouse management systems which follow best practices in its field for efficient inventory, packing and distribution of the products. In order to safely store , pack and distribute the product, Yashaswi has commissioned a state of the art warehouse. The warehouse is equipped with latest technologies in temperature and pneumatic controlled interiors to ensure the freshness and quality of the products. The complete warehouse is managed by the latest in warehouse management systems which follow best practices in its field for efficient inventory, packing and distribution of the products. All employees are made to follow strict processes and procedures which ensures top hygiene, ensure quality standards and zero error in the right pack reaching the right customer. 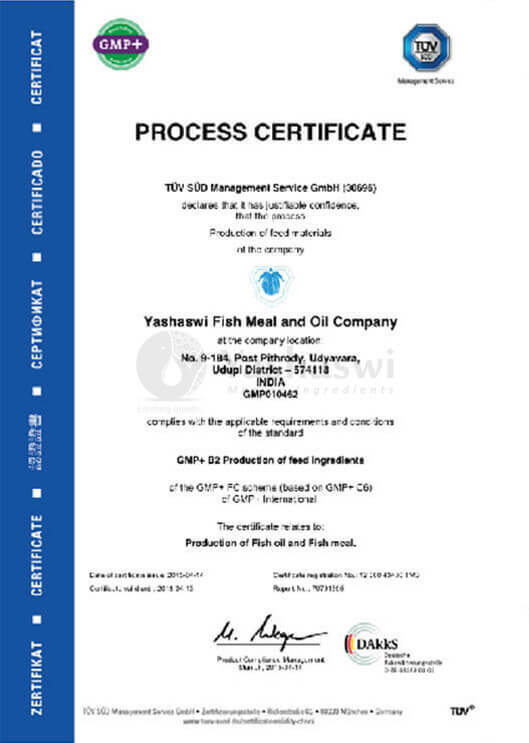 The Fish Meal and Fish Oil which we produce are dosed with Food Graded Antioxidants which contains BHA (E320) and BHT (E321), with required quantity to maintain the good quality during the shelf life period. 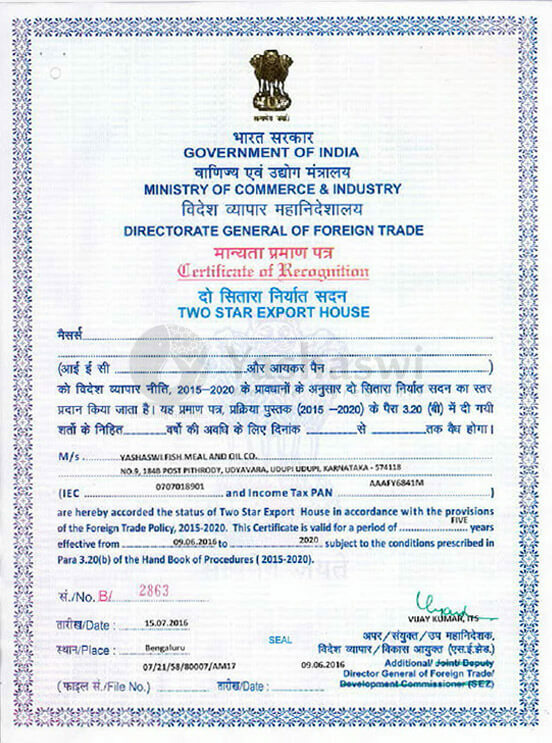 The Raw Material once received in the factory are subjected to inspect for following criteria, which should meet acceptance requirement for the acceptance otherwise it will be rejected. Our Fish meal is an important marine ingredient for aqua feed derived from fresh sea caught Indian Oil Sardines scientifically named as Sardinella Longiceps. As a basic ingredient for Prawn Feed and Fish Feed, our Fish Oil which is extracted from Fresh sea caught Indian Oil Sardine. Our Fish meal is an important marine ingredient for aqua feed derived from fresh sea caught Indian Oil Sardines scientifically named as Sardinella Longiceps. Fish meal has become an unavoidable feed ingredient in aquaculture, poultry and animal rearing industries due to its high nutritional values. Marine ingredients, particularly fish meal and fish oil have become major feeds used in the prawn industry to raise farmed prawns and shrimps. Fish meal in diets increase feed efficiency and growth through better feed palatability and enhances nutrient uptake, digestion and absorption. 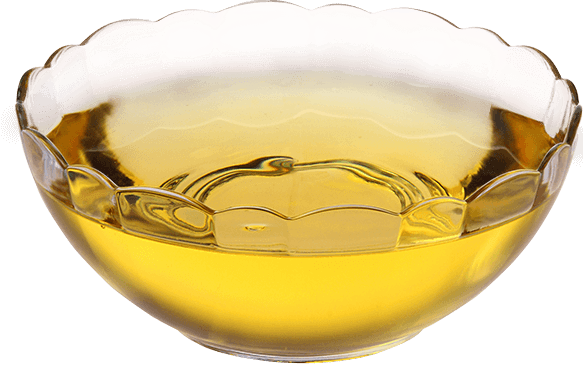 Crude Fish Oil As a basic ingredient for Prawn Feed and Fish Feed, our Fish Oil which is extracted from Fresh sea caught Indian Oil Sardine (Sardinella Longiceps) which provides required essential nutritional factors. Being rich in EPA+ DHA content, the Fish Oil plays a major role in growth of farmed Produce, Salmon fish farming and also it’s an essential ingredient for Pet animal feed. 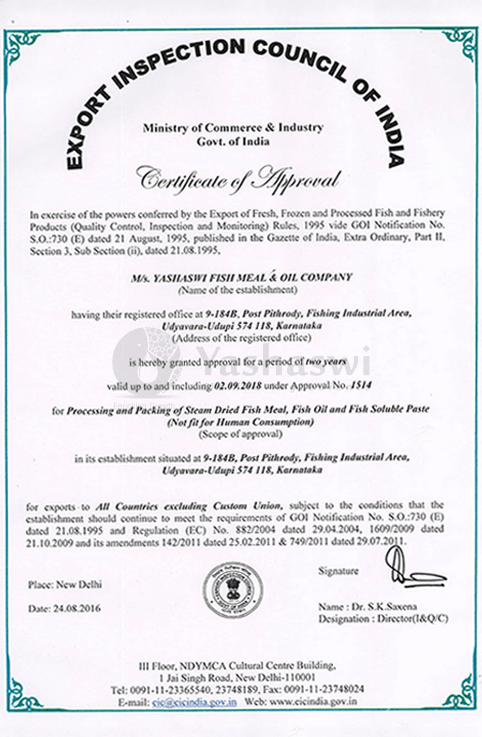 In addition we supply fish oil to various industrial applications and pharmaceutical companies. Packing is either in Flexi bags or drums (MS / Food graded HDPE), as per Customers’ requirement. To ensure traceability each pack is marked with a Batch code which tracks right from sourcing parameters to end customer. The name of the landing center of the vessel. Details of loading raw materials in truck such as Condition of the truck, Truck number, Loading time, Material quantity and Unloading Time. Results of analysis under chemical and microbiological parameters.